On this page I present a detailed examination of the amount of error of the representations of all prime-factors from 3 to 43 (an arbitrarily selected stopping point), for several various EDOs. Different EDOs approximate JI intervals in different ways. 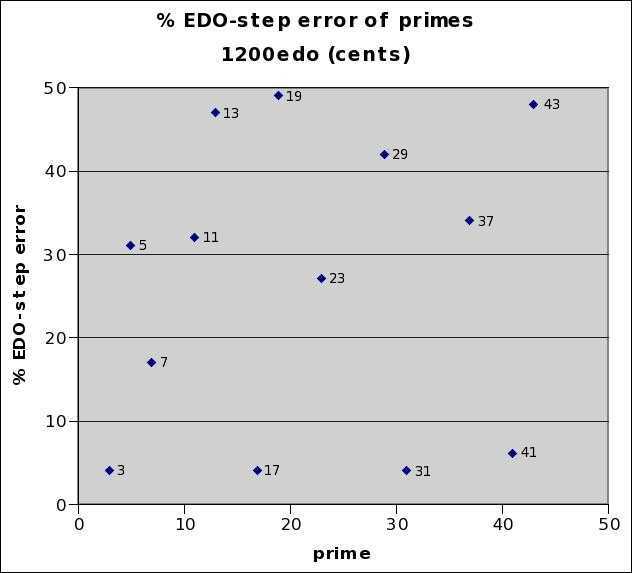 In these listings, errors are given both in cents and as a percentage of one degree or "step" of that EDO, and these latter values are shown on the graphs. Thus, the maximum error on the graph is 50%, which would indicate that the prime-factor lies midway between two neighboring EDO degrees. Error values tend to cluster into groups -- this clustering is plainly visible on the graphs, and I have also divided the lists accordingly, putting a blank row between clusters. 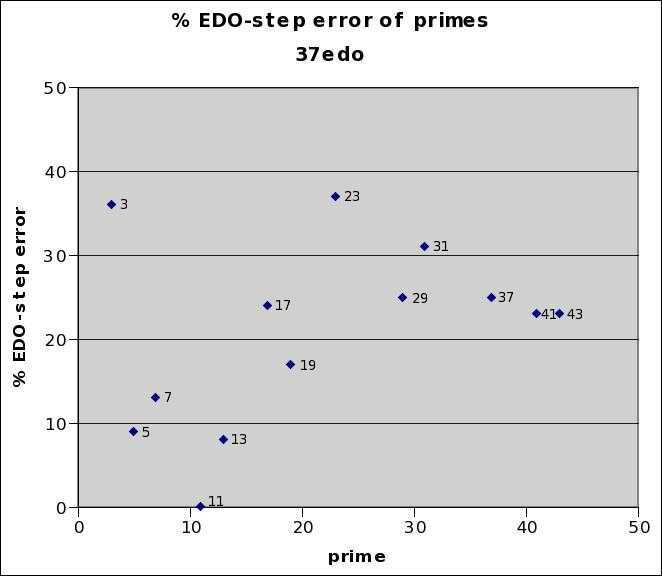 10edo gives a suberb representation of prime-factor 13 (only ~ -0.5 cent error), and fair-to-mediocre representations of 7 (~ -9 cents error), 37, 17, and 3. It does quite poorly with 5, 11, and 19. 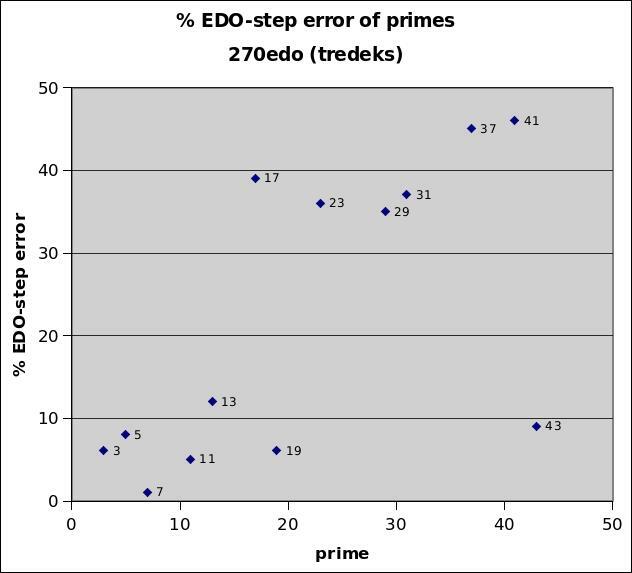 11edo gives fairly good representations of prime-factors 17 and 11 (~ +4 and -6 cents error, respectively) but does a terrible job with 3 and 5 (~ -47 and +50 cents error). 12edo gives excellent representations of the Pythagorean prime-factor 3 (~ -2 cents error), and of 19 (~ +2.5 cents error) and 17 (~ -5 cents error). Because of the fact that the 5-limit "3rds" ( major and minor) are both represented by 5 degrees of 17edo, which is really a "neutral 3rd", it cannot emulate 5-limit tuning well, but rather functions primarily as a Pythagorean tuning, with 4 and 6 degrees being good representations of [-3 0] (i.e., 3-3) and [4 0] (= 34), respectively. Besides giving a very good representation of the Pythagorean prime-factor 3 (~ +4 cents error), 17edo also gives decent representations of 13 and 23. 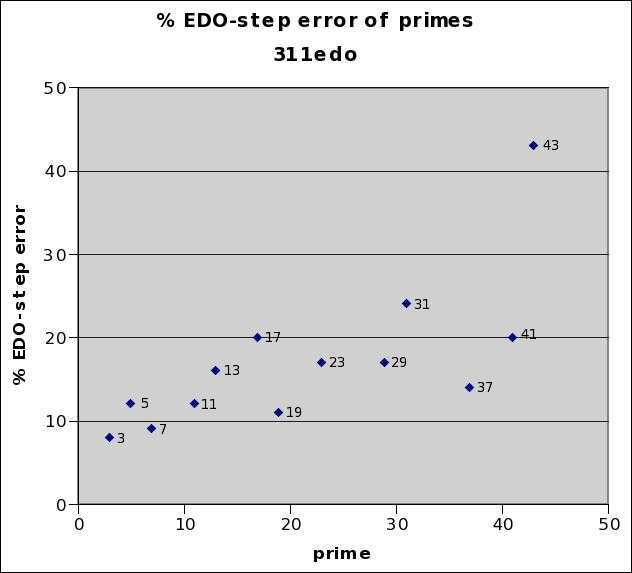 None of 18edo's representations of lower primes is very good, the best error being about 1/5 of an 18edo degree, and most of the lower primes falling nearly midway between two neighboring 18edo degrees. 41edo gives a superb representation of the Pythagorean prime-factor 3, and decent representations of 5, 7, and 11. The striking thing to observe about 55edo is that, despite its status as a "standard" tuning during the meantone era (see my webpage on <../monzo/55edo/55edo>Mozart's Tuning), none of its lower-prime representations is especially good in terms of relative error: the best approximations are about 1/5 of a 55edo degree off. The fact that 72edo's approximations do not temper out so many important 5-limit intervals means that, even tho it is not as accurate as the lower-cardinality <#53">53edo in representing the entire 5-limit lattice, its structure does emulate so many of the important JI commas that in a systemic sense it is easily perceived as a good approximation of 11-limit JI. 270edo is very useful as an integer unit of interval measurement. Since 270 is a fairly high cardinality, the absolute error amounts are all fairly small. What is important is that all prime-factors up to the 13-limit are approximated with extremely small relative error (i.e., percentage of a 270-edo degree), all less than 13%, which thus obviates the need for decimal places when mapping to 270edo. Joe Monzo advocates its use, with the name "tredek", as a replacement for cents. 311edo is very useful as an integer unit of interval measurement. Since 311 is a fairly high cardinality, the absolute error amounts are all fairly small. What is important is that all prime-factors up to the 41-limit are approximated with very little relative error (i.e., percentage of a 311 degree), which thus obviates the need for decimal places when mapping to 311edo. Joe Monzo advocates its use, with the name "gene", as a replacement for cents. 768edo is important for users of MIDI, because it is a standard tuning resolution on many MIDI instruments and soundcards. One degree of 768edo is a hexamu. At this level of resolution, even the largest error shown is still less than 2/3 cent. But it is important to know how 768edo maps the primes because a MIDI user may get different results than expected because of rounding errors or data truncation. 1200edo is important because of its widespread use as a unit of logarithmic interval measurement, known as the cent. It is a division of the 12-edo semitone into exactly 100 equal parts. On all the equal-temperaments presented on this page, the error is given as both an absolute value, in cents, and as a relative value, in the percentage of one step of that equal-temperament. Because 1200-edo defines the cent, both sets of values here are equivalent. MouseOver the cardinality names of the various EDOs to see a bingo-card lattice of them showing the error from the closest EDO approximation to JI.